The old way of doing things will always carry a sort of novelty, almost always born of nostalgia. This is what happens when we watch old movies, and find ourselves pining for (or at least, curious about) the way things were. So when we see these things again in the modern day, they are very likely to cause a stir. 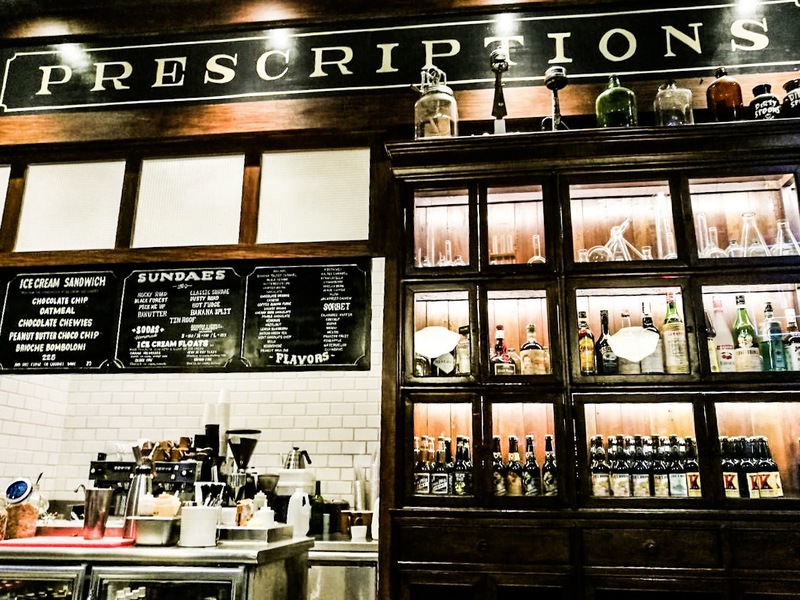 For example, when was the last time you actually saw soda and ice cream being served at a bar in a drugstore? Yeah, that’s where the groovy folks used to hang out. It seems weird nowadays, but that’s really how they did it then. And now, a place in Bonifacio Global City seeks to relive the past and at the same time offer something new. Aptly named “Farmacy”, this new ice cream parlor is making waves by serving excellent store-made ice cream in a circa 19th century vibe. But is it just a novelty concept, or is there something more? We chose to find out ourselves. Entering the place housed at the ground floor of the Net Lima building was like walking through a time portal of sorts. There were bar stools on a counter, and there were high wooden chairs outside. The floor-to-ceiling windows of the shop allows an ample amount of natural light in, minimizing the need for artificial light (but there were a lot of the latter, anyway). A huge sign says “Prescriptions” behind the counter. Off to one end of the bench, there is an open kitchen where you can see the magic happening: you can actually see the staff chopping, blending, and mixing what will be the next batch of delectable ice cream served to the patrons. The products will be stored in stainless steel containers, from which they will be constantly whittled away by the customers. In fact, you don’t even have to buy to taste the products they so expertly make. The staff will happily give you free tastes to help you decide which flavor you love best. And if you’re planning to sample all the flavors they have, then I hope you’re not on a diet — their flavors list literally goes from floor to ceiling! While not all are available at once, those that are (the ones with the white dots on the list) would be enough to give you a hard time choosing. An in case you want something else other than ice cream (shakes, drinks, and more) they also have a menu — printed in the same old-fashioned design as everything else! The prices are common for a BGC establishment, but not so that it’s out of reach. But of course, we did not just ogle at the old-fashioned atmosphere and the wonder of making ice cream. 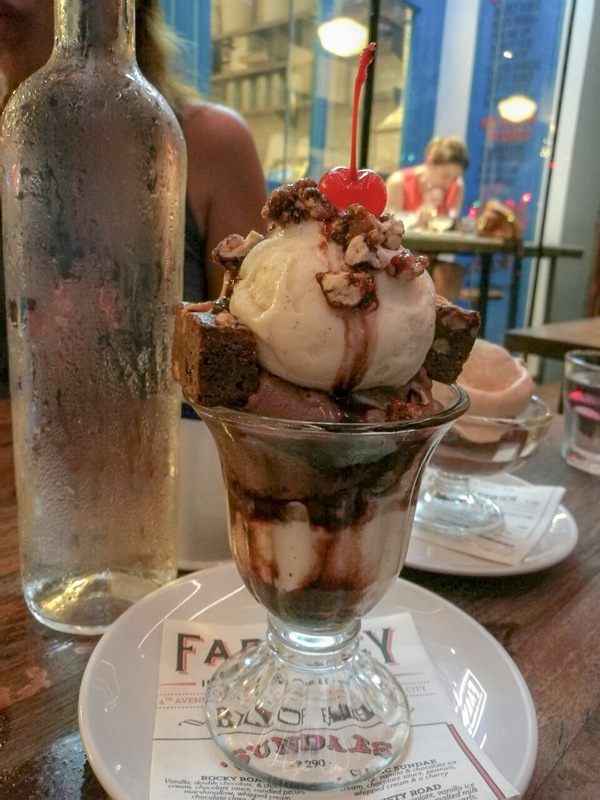 We decided to taste Farmacy’s vaunted desserts for ourselves! Brownie A La Mode. We made our own brownie, which was cool! 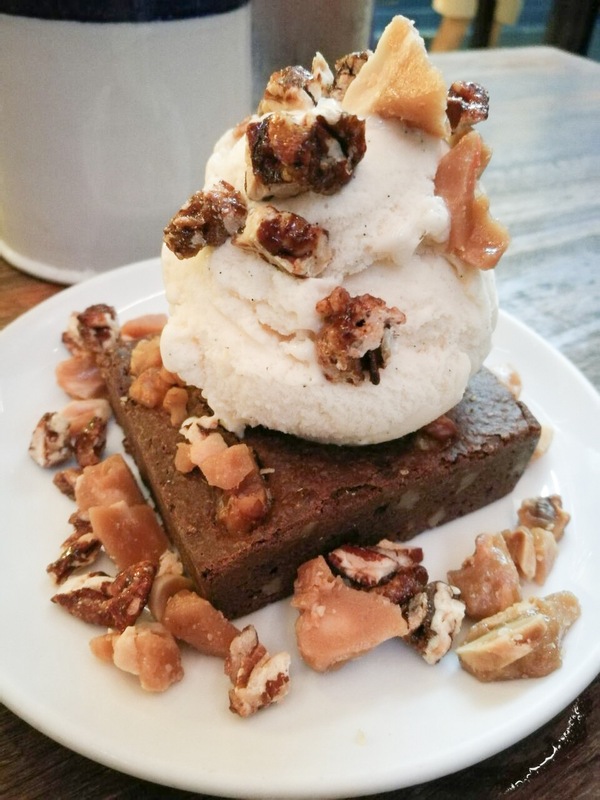 The candied pecan that came atop the vanilla ice cream was a really special touch. The ice cream itself was velvety smooth, and you can really taste the good quality of the ingredients that they are using. Hot Fudge Sundae. Here, I opted to use candied pecans instead of the regular peanuts. Because why not? I chose to have not just one serving of something I love! I tried the double scoop as well, and I had Salted Caramel and Chocolate Orange. It was a heavenly treat! You can actually get a taste of the real fruit here, not just flavorings. The ice cream was thick and flavorful, and there are as many variations as there are flavors. If you want something other than cold treats, Farmacy also offers various donuts and cookies. There’s also bread in tandem with ice cream scoops, including a copy of the traditional Filipino ice cream-and-pandesal duo in the form of the Brioche Bomboloni. Sure, ice cream aficionados could point out some places where the ice cream tastes better. But that’s not all there is to Farmacy. As a whole, the establishment has the idea of an ice cream parlor right down to an art. It is the ultimate throwback to those times when everything was really natural, and everything was really handmade. Sure, technology and modern additives can make things taste better, but they can’t make the experience more fun. That’s what Farmacy excels in most. That, and thinking up various concoctions to partner their ice cream with! While most modern ice cream parlors target the kids, this one targets the kid-at-heart. Head over to it, and see how your expectations for dessert will never be the same again!